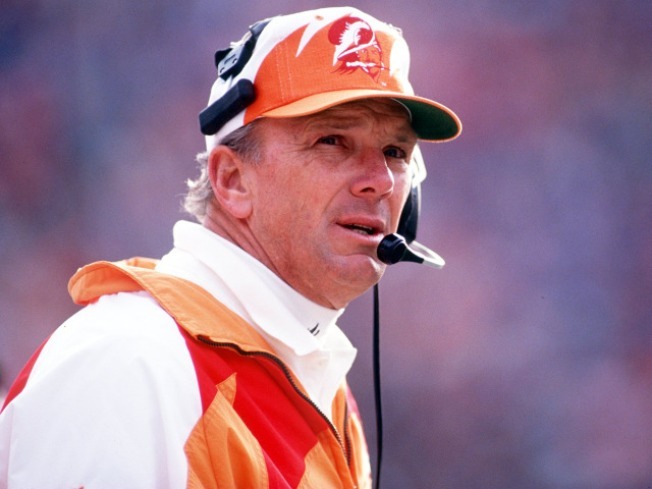 Former NFL head coach Sam Wyche is now rooting for the GOP. In Pickens County, S.C., a volunteer assistant high school football coach and newcomer to the county council is mulling a move up, to Congress. Sam Wyche doesn’t have much of a political resume, but nearly every football fan in northwestern South Carolina knows his name. He’s the former head coach of Cincinnati Bengals – and that name recognition would certainly help in a crowded primary of six other Republicans to replace Rep. Gresham Barrett. "It opens the door so you don’t need to explain who you are. I usually get more questions about coaching Joe Montana and Boomer Esiason – and then you’re off and running,” said Wyche, a pioneer of the high-speed, no-huddle offense. If he runs, Wyche would be the latest candidate to go from the pro gridiron to campaign trial, in a year when at least three other NFL veterans have weighed a run for political office. And the men all have one thing in common — they’re Republicans, like nearly every professional football player or coach who has made a bid for elected office in recent years. There’s something about football and the Grand Old Party, with a connection that dates back at least to President Richard Nixon famously drafting a trick play for the Washington Redskins under coach George Allen – who ran the commander-in-chief's trick play for a crucial 13-yard loss. Allen’s son, also George, later became a Republican governor and senator from Virginia. During the Republican wave in 1994, Seahawks Hall-of-Fame wide receiver Steve Largent was swept into Congress, as was former University of Oklahoma quarterback J.C. Watts. Both men were elected in Oklahoma, where they grew up and played in college. There's one notable exception to the Republican rule — Rep. Heath Shuler (D-N.C.), the 1993 Heisman Trophy runner-up for the University of Tennessee and former Washington Redskins quarterback, and the only Democratic pro football player ever to win a high-profile or national race. But Watts notes that even Shuler's plenty conservative, and argues there's a link between football and Republicanism. "The values that Republicans espouse in terms of capitalism, free enterprise, responsibility, working hard, sacrifice and commitment – that message probably resonates with the majority of athletes a lot more,” said Watts, who retired in 2003 after eight years in Congress. Others say the link has more to do with regional quirks than any natural connection between Xs and Os and the GOP. "There's an impulse to draw a direct line between the discipline and self reliance required to succeed in football and laissez faire, individualistic conservative philosophies," said Chris Brown, editor of the Smart Football website. "But I don't think there's enough evidence for that, particularly since the ex-football players in Congress are more social conservative than libertarian." This election cycle, all of the former pro athletes and coaches migrating into national politics have been football players, and all of them are Republicans, though not all of them have southern roots. The one former National Football League star already up and running in this cycle is former Bills and Steelers tight end Jay Riemersma, who is in the midst of a competitive primary campaign for the seat of retiring Michigan congressman Pete Hoekstra (R-Mich.). Riemersma got his political chops working as a Midwest regional director for the conservative Family Research Council, but he said most people recognize him from his playing days at the University of Michigan. Riemersma – who's competing in the primary with state Rep. Bill Huizenga, a three-term state legislator who once served as Hoekstra's director of public policy – said he’s eager to contrast his opponent’s experience in politics with his outsider persona. House Republicans’ also had a recruiting strategy to go after community leaders as much as elected officials – which helps explain why some football players got a look. Others, so far, have tested the waters but stayed out. Former GOP congressman Robin Hayes, who lost his re-election bid last year to Rep. Larry Kissell (D-N.C.), asked Mike Minter, the Carolina Panthers all-time leading tackler, to run for his old seat and arranged meetings for him with the National Republican Congressional Committee in Washington. Florida Republicans courted Peter Boulware, a first-team All American linebacker at Florida State who became the Baltimore Ravens’ all-time sacks leader, to challenge Rep. Allen Boyd (D-Fla.), though he has decided to sit it out. Probably the biggest name from the world of football to consider a run this year was Lou Holtz, the legendary coach of Notre Dame who also briefly coached the New York Jets. “Chairman Sessions has put an emphasis on finding community leaders who have their own brand and who are known outside of politics. And coaches and well-known football players are a very good example of that category,” said National Republican Congressional Committee spokesman Paul Lindsay. Some speculated that his retreat came because of his comments during a 2008 ESPN program, when Holtz said Adolph Hitler was “a great leader,” though he later apologized. Others, though, have taken the plunge. Largent and Watts eventually were joined in Congress by former Nebraska Cornhuskers coach Tom Osborne in 2000, while former 49ers and Patriots tight end Russ Francis fell short in his House bid in Hawaii. In 2006, Steelers Hall-of-Fame wide receiver Lynn Swann ran unsuccessfully against Democratic Gov. Ed Rendell in Pennsylvania. Going farther back, not only did 1965 AFL MVP QB Jack Kemp became a Senator, vice presidential candidate, and political force to be reckoned with in Western New York, but so did his backup on the Buffalo Bills, Ed Rutkowski, who served two full terms as the Erie County Executive. While major league baseball players who've turned to politics are also overwhelmingly Republican, there are a lot fewer of them. The only active player turned politician on the national stage is Hall of Fame pitcher Jim Bunning, who retired in 1971 with what was then the second-most strikeouts ever, and now is retiring at the end of his second term in the Senate from Kentucky. The only previous player to win national office was Wilmer "Vinegar Bend" Mizell, a southpaw for the St. Louis Cardinals, Pittsburgh Pirates, and New York Mets from 1952 to 1962, who was elected to a North Carolina House seat in 1969, serving three terms before being swept out of office in the post-Watergate Democratic wave. Hall of fame pitcher Walter "Big Train" Johnson fell short in a Maryland House bid in 1940, and Yankees second baseman and seven-time all-star Bobby Richardson lost a 1976 congressional bid in South Carolina. All of them ran as Republicans. Tim Marchman, editor of baseball blog Improve Conditions and a writer for the Wall Street Journal and Sports Illustrated, argues that the biggest reason that football produces more politicians than baseball is that football players "go to college, and the big schools that produce star players, many of them in the south, also let those players tap into a ready network of politically-connected alumni and donors, while pro-tracked baseball players -- who are also much more likely than their football counterparts to be foreign born -- usually head from high school to the minor leagues." The one big sport that leans to the left is basketball. The two NBA payers to earn national office have both been Democrats and, oddly enough, Rhodes scholars. Knicks great Bill Bradley was a three-term Senator for New Jersey, and an early favorite in the 2000 Democratic presidential field. Tom McMillen, a 6'11" power forward and center for the Braves, Knicks, Hawks and Bullets, was a Maryland congressman from 1987 to 1992, and still is believed to hold the title of tallest member of Congress ever. Locally, newly elected mayors David Bing in Detroit and Kevin Johnson in Sacramento are both Democrats. The one exception to the rule is Charles Barkley, a longtime Republican who's already announced that he'll run for governor of Alabama in 2014 as an independent, though his well-documented drinking and gambling habits could put a damper on his political prospects. Though Republican leaders have courted Boulware – who lost by just 430 votes in a traditionally Democratic district after Florida Republicans recruited him to run for the statehouse in his college hometown of Tallahassee in 2008 – for a House run this year, the linebacker says his political career is over.